The Strafe RGB is not as nicely built as the K65 keyboards that I have. It is plastic, not metal, and lack the separate media keys. One review I saw claimed that this was a concession to cost, with the silent switches being significantly more expensive. Thus, to keep the overall cost down with other keyboards, the basic board had to be cheapened a bit. The RGB lighting works just as for the K65 keyboard, so that was not an issue. The keyboard also has light ramps on the sides, which just do not seem to do much in terms of aesthetics… but can be really annoying as discussed below. What is also missing is a pass-through USB port or a USB hub, which means that the mouse had to be attached directly to the computer instead of to the keyboard. That is a bit of handicap in some settings, but perfectly OK for my home office where I have both keyboard and mouse plugged into the monitor. The switches on the keyboard are billed as ”Cherry MX Silent”, but seem to be now called ”Cherry MX Silent Red” on the Cherry website (I took off the keycaps to check the color). In my subjective opinion, they are a lot less noisy than the Blue switches that I have at work. Compared to the standard Red switches in my K65 keyboards, the noise level is also lower. I also think it is a bit less noisy that the Matias Quiet. While still being a lot more noisy that a dome keyboard like the Logitech Illuminated Keyboard K740 that I also have. The feeling of the keys is a lot better than the K740, but softer than the K65. It is decent mechanical keyboard, even if the real clickety join of real fast typing switches are missing. Overall, I am happy with the trade-off. If I take some care and hold back a bit on my typing, trying to a be a bit softer, it can get really quiet (at the cost of some speed and feel). There was one big annoyance with the keyboard though. For some reason, it did not go to sleep when the computer it was connected to went to sleep. Instead, it switched to a default light profile with max brightness and the side light ramps turned on at full power. Impressively bright light show overall, making a dark room not very dark at all. Which in turn meant that trying to sleep in the same room as the keyboard required physically disconnecting it. For some reason, the brightness key on the keyboard does nothing when in this mode – on my other keyboards, it is still functional and allow me to turn off the lights if needed. My other Corsair keyboards all go dark when the attached computer goes to sleep – and once the computer is back on, they light up as soon as you press a key on them. 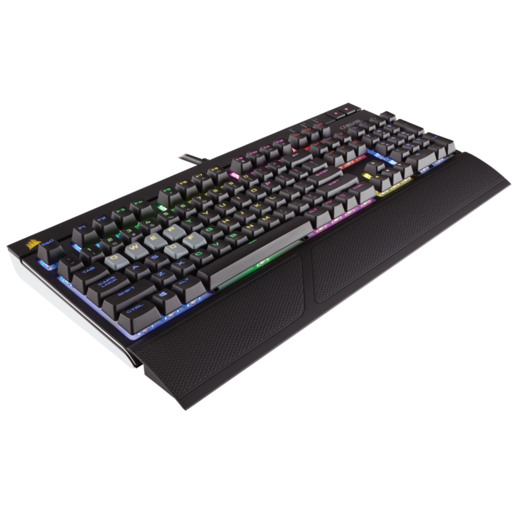 I did manage to kind of solve this problem – I figured out that the “Default” profile of the keyboard could be reprogrammed from the Corsair Utility Engine. I created a Default profile with all keys black and the side lights off, an forced that to the hardware. This results in the keyboard going dark as soon as Windows gets to lock screen or sleep – it seems to me that CUE drives my custom color profile only when I am actively logged-in and working. However, this solution negates one of the advantages of a keyboard with built-in lighting: that it is really easy to type on it in the dark. 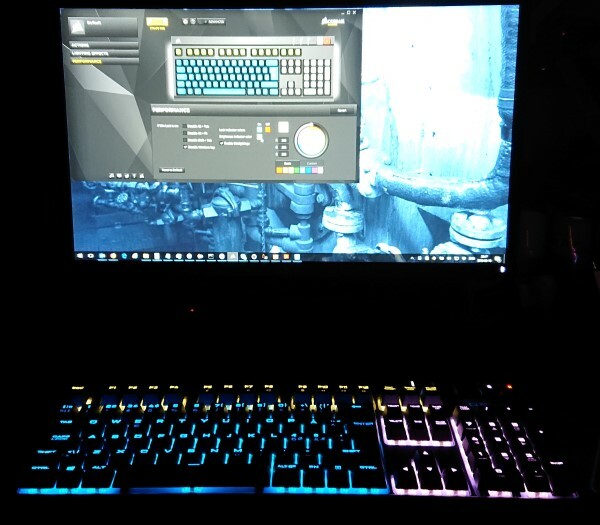 I like being able to just wake my computer and have the benefit of a lit-up keyboard while logging in. Maybe this is because the Strafe is a cheaper model, maybe I have not found the right control switch, or maybe it is due to the keyboard being connected to a powered hub in the screen rather than directly to the laptop. I happy with the keyboard despite the light annoyance – it gets the job done in a slightly less noisy way. RGB is always fun, and backlighting is useful. It could be better – the light annoyance is indeed annoying, and having the metal chassis of the K series would be nice.